Welcome to another snow day post. 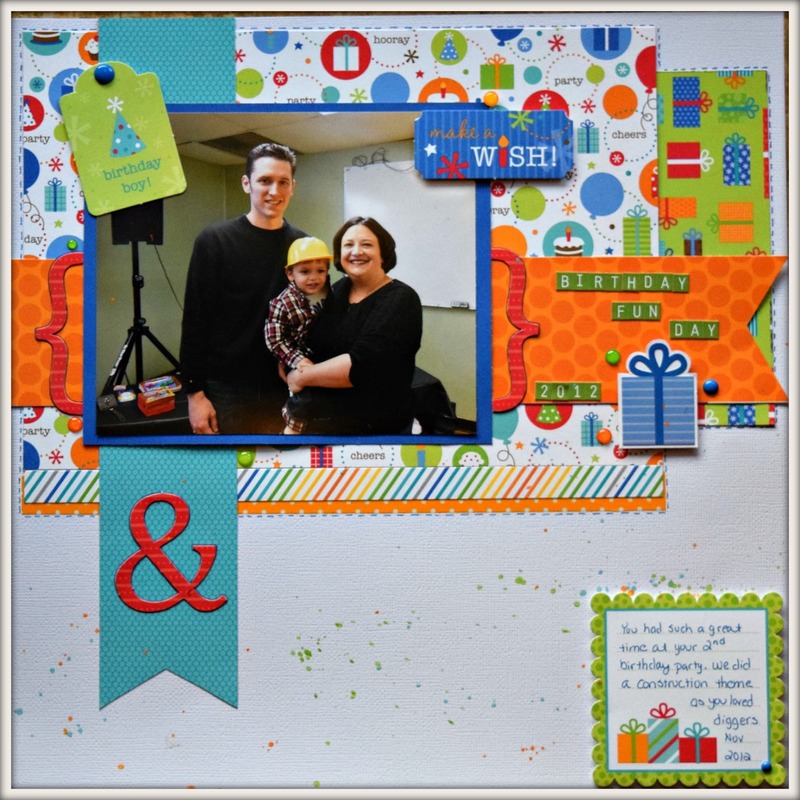 This one I completed using the January 15th sketch from Sketch-N-Scrap. It was perfect to highlight this larger photo of our family from our sons 2nd birthday back in 2012. The paper is a combination of a really old DoodleBug Collection and just and old Doodlebug Collection called Hip Hip Hooray. I outlined the brackets and ampersand to highlight them again the patterned paper. I also did some hand doodling to look like stitching along the edge of all the papers. In person it really set the design off nicely. LOVE it!!!! Great colors and the fun brackets and ampersand are great accents! Thanks for joining us at Sketch N Scrap! Great layout! I love the bright colors!! Thanks for joining us at Sketch N Scrap!! Fabulous work on the sketch! Love the bright, happy colors! Thank you so much for joining us at Sketch N Scrap! love the bright colors! Thanks for joining us at Sketch N Scrap! This is such a fun page! Great papers that you chose to go along with your theme! Love it! Thanks for playing along at Sketch N Scrap! Beautiful layout! Love the bright colors. Thanks for joining us at Sketch N Scrap. I love this fun, bright page! I love all of your "stitching" too! Thanks so much for sharing with us at Sketch N Scrap! Awesome layout, very fun colors! Thanks for joining us at Sketch N Scrap.